Saint Pachomios was born of pagan parents in the Upper Thebaid of Egypt. He was conscripted into the Roman army at an early age. While quartered with the other soldiers in the prison in Thebes, Pachomios was astonished at the kindness shown them by the local Christians, who relieved their distress by bringing them food and drink. Upon inquiring who they were, he believed in Christ and vowed that once delivered from the army, he would serve Him all the days of his life. 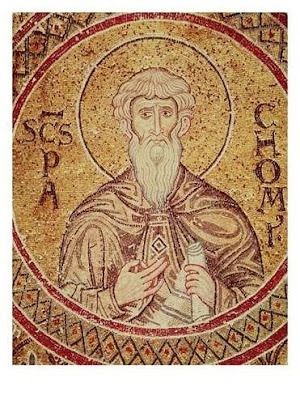 Released from military service, about the year 313, he was baptized, and became a disciple of the hermit Palamon, under whose exacting guidance he increased in virtue and grace, and reached such a height of holiness that "because of the purity of his heart," says his biographer, "he was, as it were, seeing the invisible God as in a mirror." His renown spread far, and so many came to him to be his disciples that he founded nine monasteries in all, filled with many thousands of monks, to whom he gave a rule of life, which became the pattern for all communal monasticism after him. 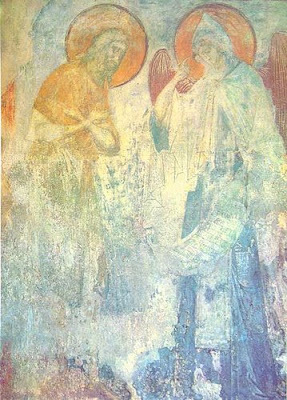 While Saint Anthony the Great is the father of hermits, Saint Pachomios is the founder of the cenobitic life in Egypt; because Pachomios had founded a way of monasticism accessible to so many, Anthony said that he "walks the way of the Apostles." Saint Pachomios fell asleep in the Lord before his contemporaries Anthony and Athanasius the Great, in the year 346. His name in Coptic, Pachom, means "eagle." -- The great Pachomios was asked once by a brother, ‘Why is it that before the demon comes to trouble us, we possess our mind’s understanding in a healthy state and we philosophize about temperance, humility, and the other virtues, but when the hour comes to display in deed what we have been philosophizing about, such as longsuffering in the time of anger, absence of vainglory when subjected to praise, and many other similar things, we are often defeated?’ In answer to this the Great Man said, ‘Because we do not pursue the active life perfectly—that is why we do not understand all the demons’ mind and versatility well enough to be able, when the Troubler manifests his presence, to repel swiftly the confusion of such thoughts which surrounds us by the contemplative power of the soul. Therefore,’ he said, ‘let us pour the fear of God like oil upon the contemplative part of the soul, every day and every hour. That fear, which accomplishes works and is a lamp for the contemplation of the things that concern us, makes our mind unshakable, not carried away by anger, wrath, rancor, and any of the other passions which lead us to wickedness. It makes it contemplative and raises it to that incorporeal region; it forces it to hold in contempt the things which are wrought by devils and prepares it to "tread underfoot serpents and scorpions and all the whole strength of the enemy"' (Luke 10:19). -- Once, while living in the desert, Pachomios learned that the city of Alexandria was being ravaged by famine and epidemic. He spent several days in tears, not even eating the meager ration of food which he allowed himself. His novices begged him to eat and restore his strength but St Pachomios replied, "How can I eat when my brethren do not have bread?" How far are even the best of us from such love and commiseration? -- Pachomios memorized the Holy Scriptures. When he started reciting God’s words by heart, he did not do it in the fashion of many other people, but he strove to comprehend it himself, each and every thing through humility, gentleness and truth, according to the Lord’s word, “Learn from me, for I am gentle and humble of heart" (Matthew 11:29). -- Pachomios was…in the habit of stretching his arms out in prayer, without folding them soon again into a resting position, but rather keeping them stretched out, as if on a cross, in order to force the body to labor and stay awake in prayer. -- Pachomios believed that “it was not good to ask for office and glory” and, wary of ecclesiastical politics, felt that “a clerical office is the beginning of contemplation of the lust for power”. -- As the Vita Prima Graeca informs us, the few monks of the early days of the Pachomian community marveled at him exceedingly, because they saw him toiling…through his assumption of nearly all the care of the monastery. For he prepared the table for them at mealtime…he sowed and watered the vegetables…he answered the door every time someone would knock at it…if any one of them were sick, Pachomios himself took care of him and ministered to him during the night…he freed them of all care. -- One day Pachomios was weaving a rush mat in Tabennesis and a boy came to the weekly service in the monastery. When the boy saw him weaving, he told him, ‘Not so father! Do not turn the thread this way. Father Theodore showed us another style of weaving.’ Pachomios rose and said to the boy: ‘Yes, teach me this style.’ After the boy taught him, he sat to work gladly, having even in this matter anticipated the spirit of arrogance. If his way were the way of the flesh, he would not have cared but would even have reprimanded the child for having spoken out of turn. -- It was while Pachomios was in the desert alone, praying to be taught God’s perfect will, (that) an angel sent by the Lord appeared to him…and (said) ‘The Lord’s will is to minister to the race of men and to reconcile them to him.’ It was after he thought about the voice which he had heard and realized its meaning (that) he started to receive those who came to him. -- The wife of one of the area’s leading politicians was bleeding. And when she heard about the great Pachomios, she asked…Dionysios to summon him. After the Great Man was summoned, he sat inside the church…and she…coming near him…touched the cowl on his head and was immediately cured. -- Elder Pachomios would say: "He who in my view is a sinner is not to ask of God to see visions. For without God’s will, visions are misleading…hear now about a great vision: it is a great vision to see a pure and humble man. For what is greater…than to see the invisible God in the visible man who is his temple". Thou didst prove a chief pastor of the Chief Shepherd, Christ, guiding the flocks of monastics unto the heavenly fold, whence thou learntest of the habit and the way of life that doth befit ascetic ranks; having taught this to thy monks, thou now dancest and rejoicest with them in heavenly dwellings, O great Pachomius, our Father and guide. 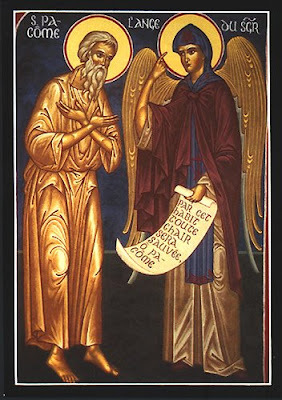 Since thou hadst shown forth the life of the Angels while in a body, O God-bearing Pachomius, thou wast also counted worthy of their glory; and with them thou standest before the Lord's throne, interceding that divine forgiveness be granted unto all.